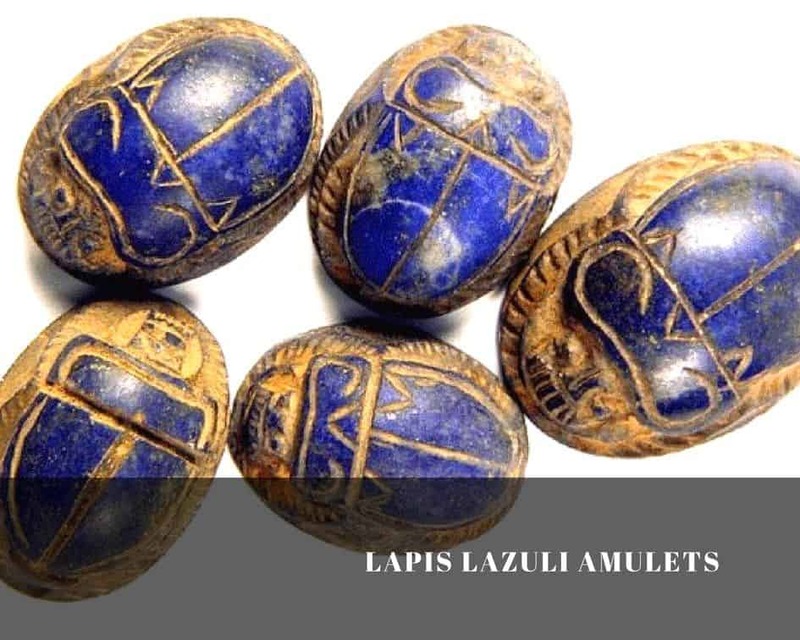 Lapis Lazuli has been mined in Afghanistan and exported to the Mediterranean world and South Asia since the Neolithic age and so since that time people believed in the Lapis Lazuli Magical Properties. Not only strong healing properties and psychic protection were associated with lapis lazuli, about which we told you in previous posts, but many more. 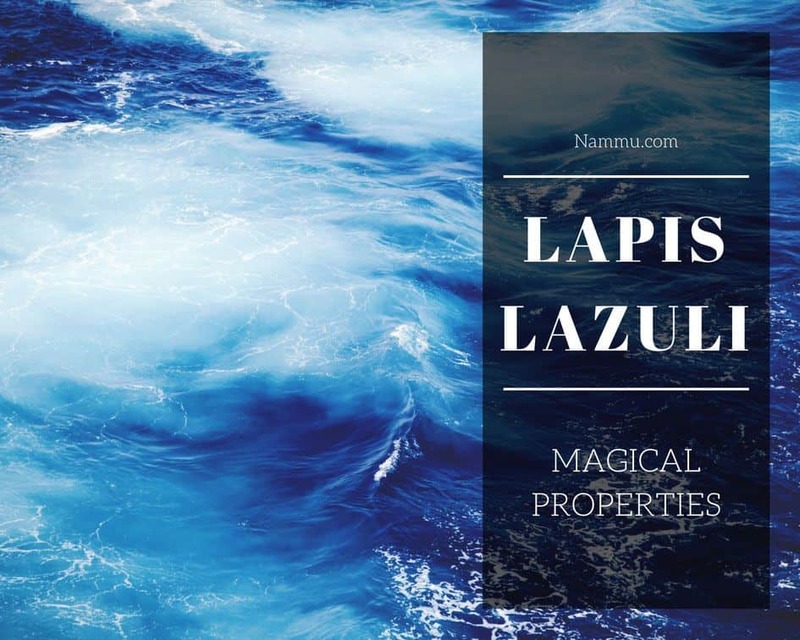 Check this post to learn about all other lapis lazuli magical properties. Even through I know about Lapis Lazuli a lot (and trust me, I do 🙂 ), this stone still amazes me every time I make my posts for you. You must know that all ancient civilizations have used lapis for their most important issues. 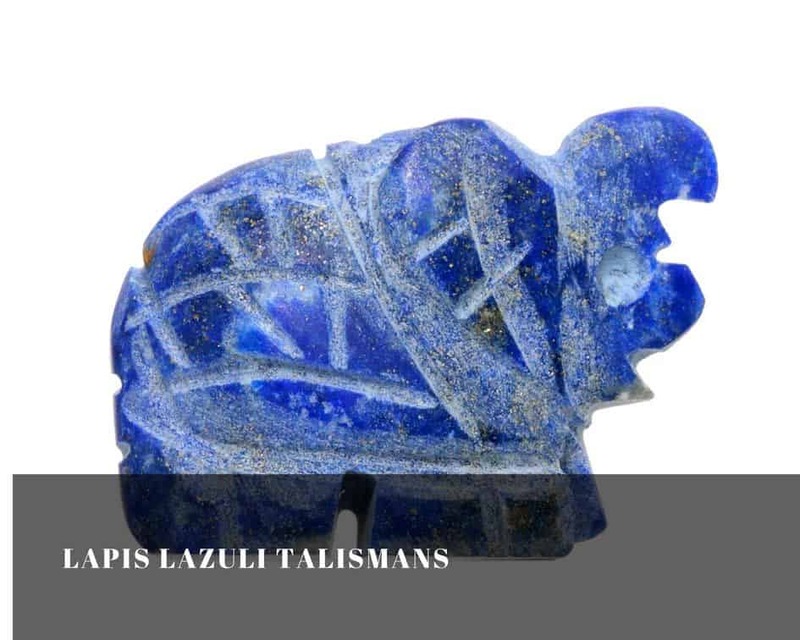 As a proof, we have already told you about Egyptian Lapis Lazuli and its attributed role in afterlife, but to leave no doubts to that statement, we are preparing another post for you – about the use and importance of lapis lazuli in various other nations, subscribe not to miss it. 3.3.1 How to Pick a Talisman? 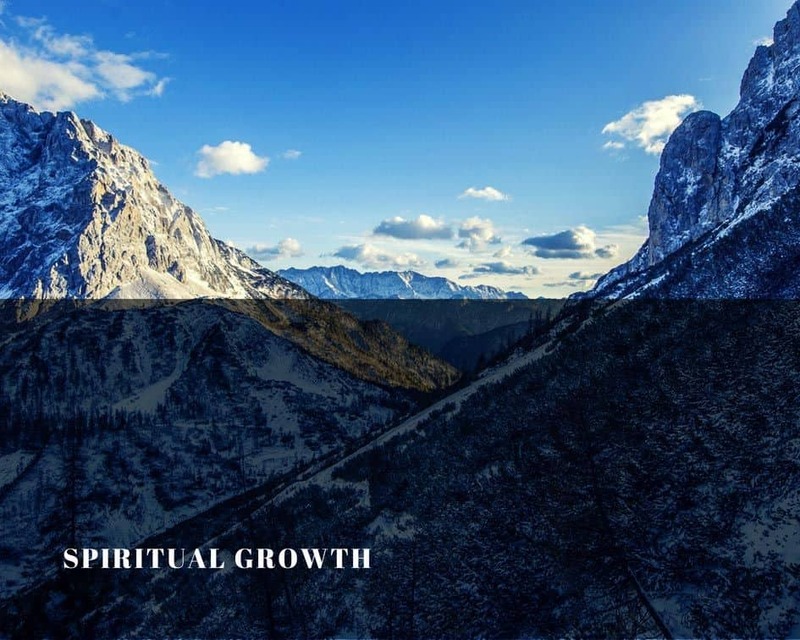 Spiritual Growth has been something all civilizations have sought since the beginning of mankind. And it is no wonder. After some time all of us start thinking about what will happen with us and our souls after this life ends. Many religions answer this question differently, but they all come to the same conclusion – your actions and the way you live your life will define your soul and your afterlife. 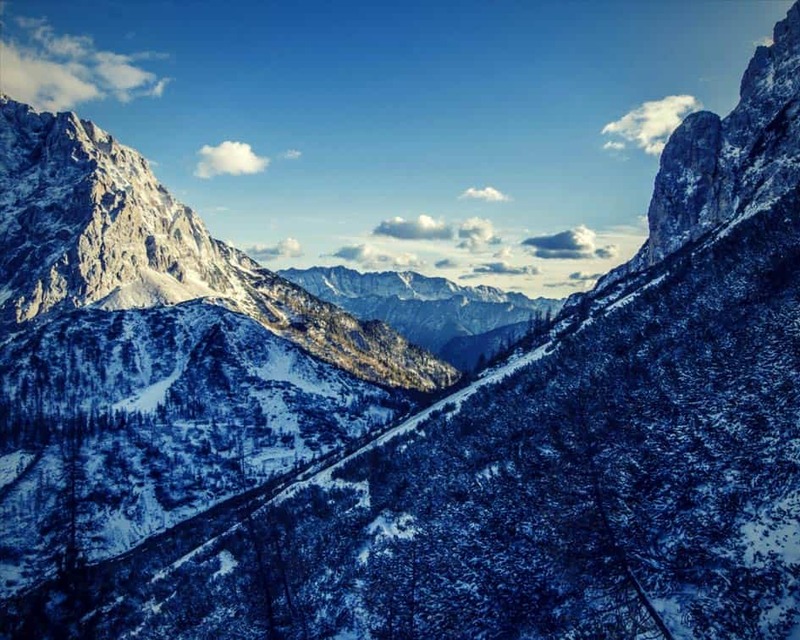 All prophets, priests and sages tell us about clear minds and souls, but you know, it is easy to have a clear mind and pure soul siting on a mountain surrounded by primeval nature. Try to keep your mind and soul pure in a public transport or on a market, when you get bumped by someone or cheated. Not so easy anymore, yeah? So, what to do? Try to use lapis lazuli! Lapis Lazuli is the ancient stone of mental and psychological health used by ancient Egyptians to access sacred knowledge. It is often referred as the “Stone of the Heaven”, as it helps in the pursuit of the heavenly self. It is believed to awaken psychic abilities helping you to recognize intuition and spiritual guidance, but most importantly, it cleanses the mind, body and spirit of toxins and negativity. Exactly what we need in our everyday life. Lapis Lazuli helps you to accept that you are different and that you have a calling. It’s a stone for those who want to dedicate their lives to some from of spiritual or higher service. 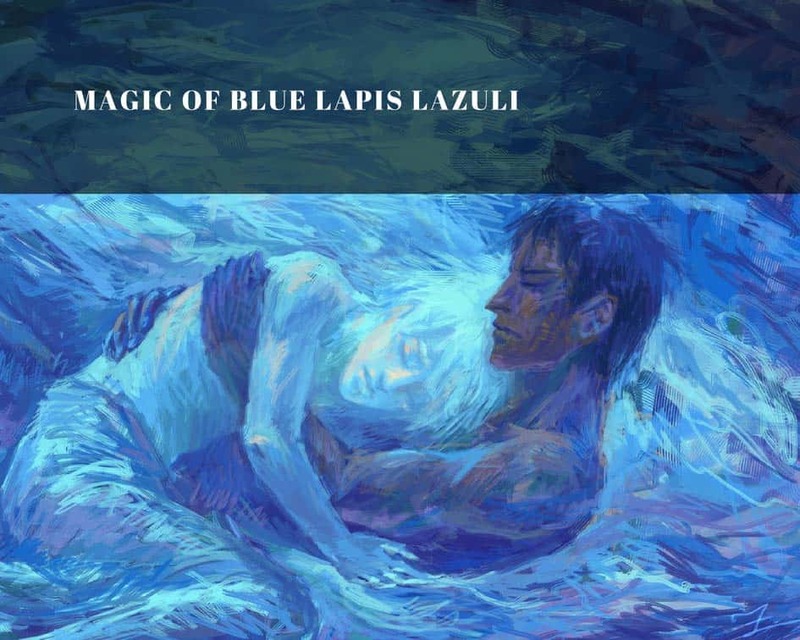 So, what do you need to do to benefit from lapis lazuli? Meditation is a technique that we all can use at any time and place. We use it to quieten the mind and restore peace and harmony within ourselves. It is also intended to help us to produce order in and around our confusion. Relaxing our minds through meditation, enables us to clear the chattering for a time and also to experience a renewed sense of energy. This in turn enables us to bring identity, clarity and also freedom to take control over our lives and to become healthier and happier. 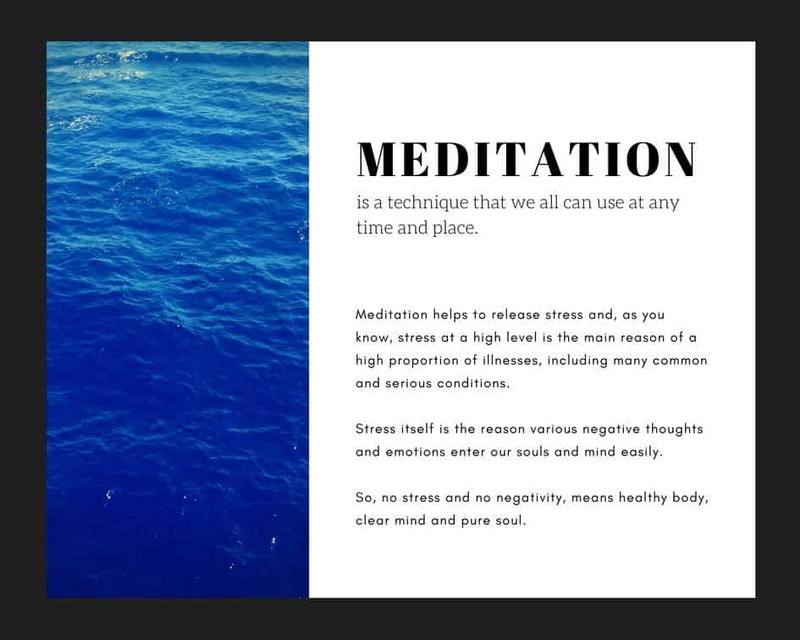 Meditation helps to release stress and, as you know, stress at a high level is the main reason of a high proportion of illnesses, including many common and serious conditions. Stress itself is the reason various negative thoughts and emotions enter our souls and mind easily. So, no stress and no negativity, means healthy body, clear mind and pure soul. 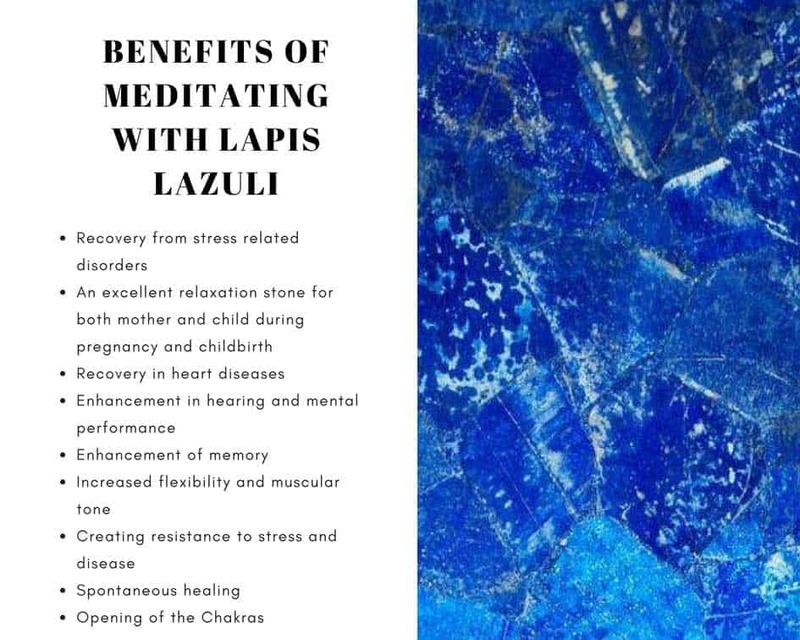 Meditation works perfectly with a serene mind, but just imagine what meditation can do to your physical and mental health with the perfect enhancer that is Lapis Lazuli. Lapis Lazuli is a magnificent meditation force. Its soothing deep blue energy restores what’s broken and balances what’s unbalanced. Lapis Lazuli Meditation is beneficial to every aspect of your being: physical, mental, emotional and spiritual. Physically: it relaxes the body and relieves tension, what slows heart rate and lowers blood pressure. It also prevents and cures a wide range of health problems and allows the mind and body to function with maximum effectiveness, leading to good health and longevity. Mentally: it also relieves stress and quiets the mind, bringing a sense of calm and serenity. There is nothing better in releasing and even eliminating stress and negativity than meditation with lapis lazuli. Lapis Lazuli also brings a greater sense of awareness in which previously unseen solutions, answers, and insights may rise to the surface. Emotionally: it releases a negative emotion which strains the heart. Lapis lazuli replaces them with feelings of love, acceptance and also peace. Spiritually: it helps to gain higher states of consciousness allowing access to the higher realms. 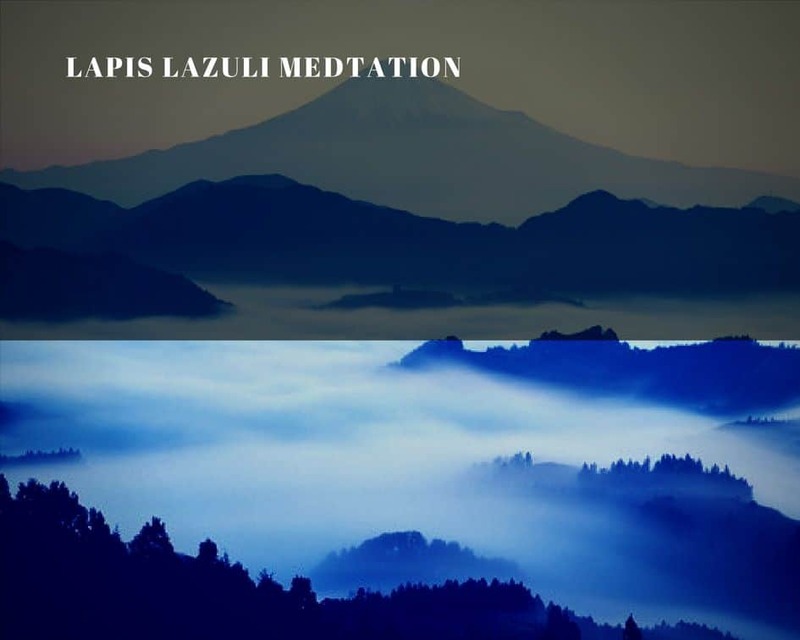 For those who are interested in even more deeper spirituality: Lapis lazuli enhances very deep meditative states aligning the wearer with the silence of spirituality. Whenever you are ready to leave the physical world for the spiritual growth, lapis jewelry is perfect for this process. This process is best in a meditative state which allows this journey to happen, stimulating deep personal and spiritual growth. Between the healing crystals, Lapis Lazuli is known as “The Stone” for connecting into past lives, past life remembrance and the Akashic Records. Excellent for astral traveling. Lapis Lazuli is also a manifestation stone. Meditating on a goal or quality you wish to manifest can bring this strong manifestation energy in. Meditating with lapis lazuli twice a day helps in prevention, regression and also the reversal of ageing. This combination is the perfect medicine. It enables us to remain in the present and remove regret for the past and anxiety for the future. It is recommended that when lapis lazuli is used in meditation, choose supplements among rose quartz, aventurine, or amethyst. These are all forms of quartz, which has a softening effect on the more “blunt force” crystals like lapis lazuli and obsidian. 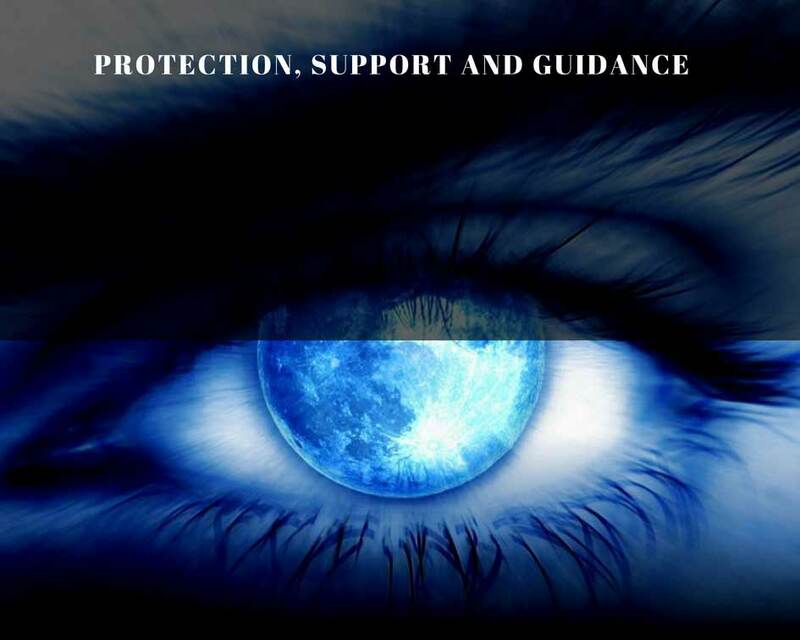 We have already told you about how lapis lazuli can offer psychic protection as well as how to use lapis lazuli to benefit from this power in Lapis Lazuli as a Psychic Protector post, but what we have not told you is about other magical properties lapis lazuli has – guidance and support. So, how to use lapis lazuli to attract god luck, get support in all you beginnings and guidance in your current affairs? Wear lapis lazuli if it is your birthstone daily or gather the whole set of birthstones and alternate them monthly to benefit from full birthstone healing powers effect. Precious gems were first associated with signs of the zodiac and were worshiped for their special gemstone meanings. According to Wikipedia, a birthstone is a gemstone that represents a person’s month of birth. It wasn’t until the first century A.D. that the Romano-Jewish scholar Titus Flavius Josephus connected 12 stones in Aaron’s breastplate (also called the Breast-plate of Judgment), 12 months of the year and 12 signs of the zodiac. This priestly breastplate was a sacred breastplate first worn by the first High Priest of the Israelites – Aaron (older brother of Moses, the same one that parted the Red Sea), according to the Book of Exodus and its 12 stones represented 12 tribes of Israel. Second stone of the second row in this breastplate was called Sapir. Despite appearing to refer to Sapphire, Sapphire as we know it today, was essentially unknown before the era of the Roman Empire. It is more likely that the term Sapir referred to a mineral of similar color to Sapphires, and that this name gradually came to refer to the latter mineral, on account of its color. Scholars think the most likely candidate is lapis lazuli, a stone with a deep, ocean-blue color which was frequently sent as a gift to Akhenaten ( ancient Egyptian pharaoh). Theophrastus (the Greek successor to Aristotle) mentions the stone sapphirus as being “dark” and having the “color of verdigris,” as well as being “speckled as of with gold.” By all accounts, his description fits the lapis-lazuli. 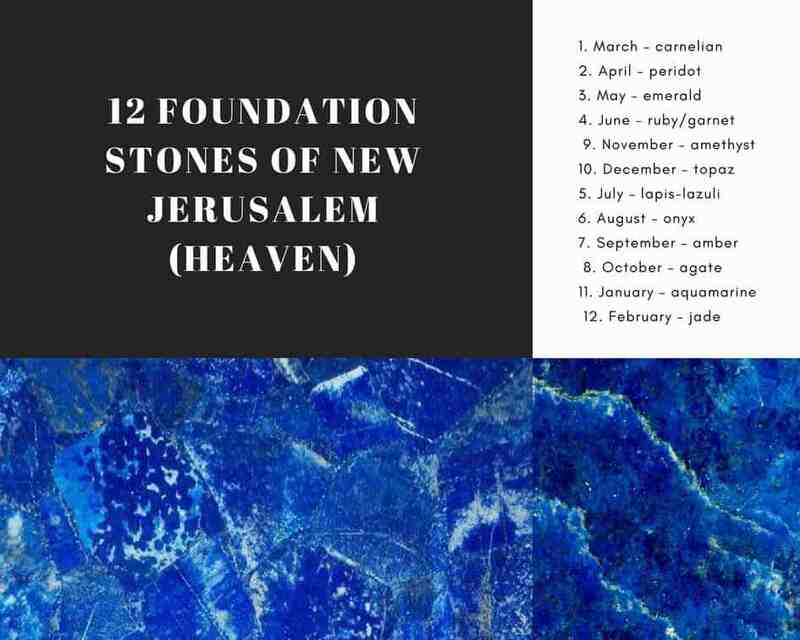 As addition, in 21 chapter of The Book of Revelation (a book of the New Testament that occupies a central place in Christian eschatology), John describes seeing the New Jerusalem (heaven), and he goes into detail about the 12 foundation stones, the streets of pure gold and the pearl gates. In Revelations, the blue sky is referred as sapphires, but as we know already they are referring to the heavenly Lapis Lazuli and not to sapphire like we know it today. 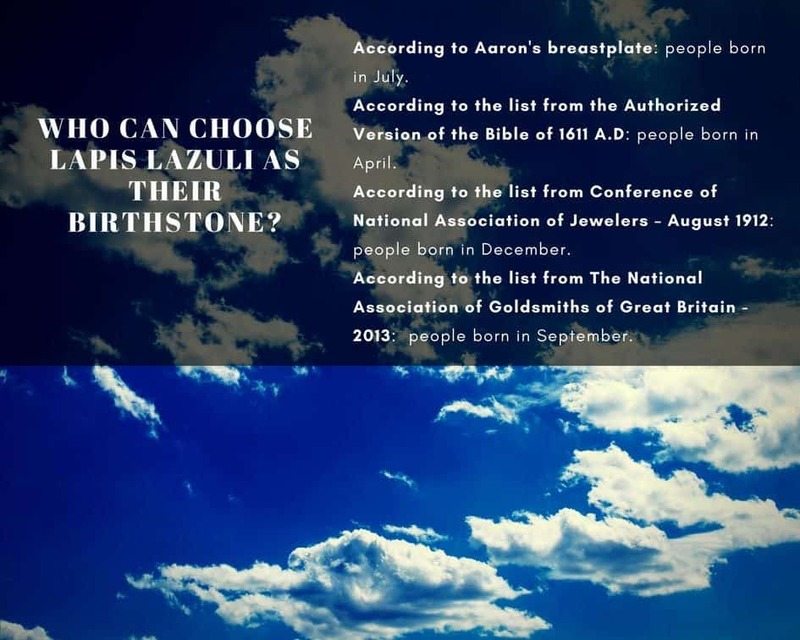 So the concept of the birthstones itself has long-lasting history that goes way back to the appearance of Christianity. But modern lists of birthstones that exist today have little to do with either the breastplate or the Foundation Stones of Christianity. Customs, tastes and confusing translations have distanced them from their historical origins. Ancient traditional birthstones are society-based birthstones. In an effort to standardize birthstones, the National Association of Jewelers adopted a list in 1912. Although some authors call this list “nothing but a piece of unfounded salesmanship”. Why? Because in 1870, Tiffany & Co. published a pamphlet that included a poem that laid out the birthstone for each month, and after that, in 1912 the National Association of Jewelers officially adopted a birthstone list. Guess what it looked like? Yes, like a list of stones from Tiffany & Co. pamphlet and had nothing to do with Aaron’s breastplate. So, who can choose lapis lazuli as their birthstone? 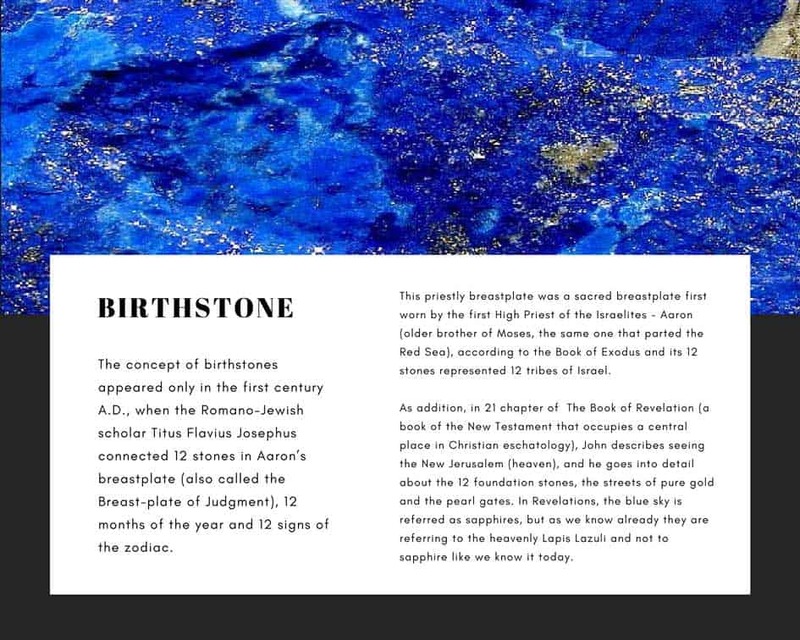 According to Aaron’s breastplate, people born in July have lapis lazuli as their birthstone. According to the list from the Authorized Version of the Bible of 1611 A.D, people born in April have lapis lazuli as their birthstone. According to the list from Conference of National Association of Jewelers – August 1912, people born in December have lapis lazuli as an alternate birthstone. According to the list from The National Association of Goldsmiths of Great Britain – 2013, people born in September have lapis lazuli as an alternate birthstone. What we would suggest is to either follow the Aaron’s order or Biblical order or follow your intuition, if you feel like lapis lazuli is for you, then choose it. There is no doubt that the owner of a ring or ornament set with a birthstone is impressed with the idea of possessing something more intimately associated with his or her personality than any other stone, however beautiful or costly. The idea that birthstones possess a certain indefinable, but nonetheless real significance, has long been present and still holds a spell over the minds of all who are gifted with a touch of imagination and romance. 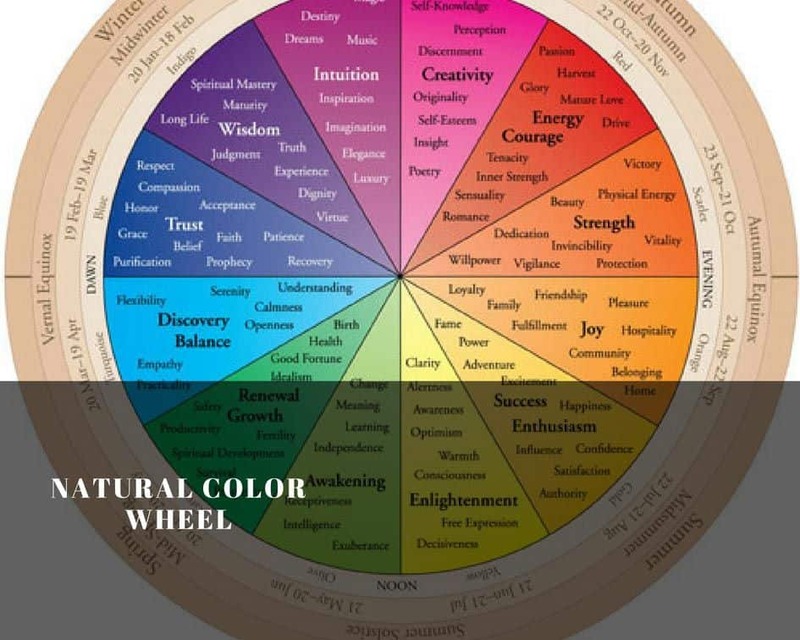 The natural color wheel shows the progression of life and color on the planet earth. In opposition to other astrological signs and other birthstone lists. This wheel shows us the color of our birth time on earth. The wheel is read in counterclockwise order. Start from the winter solstice at the top and follow the color wheel and the year around to the left. The second inner ring shows the days of the year as the year and the color changes progress through the greens of spring, the yellows of summer, and the reds of autumn. Blue is the color of the true natural birthstones of those born as the world awaits the vernal equinox and spring (February 19 – March 19). This is a time when new life is about to burst forth, a time of faith and trust. So, according to natural color wheel, lapis lazuli as the bluest of the blues is a birthstone for people under the Zodiac sign of Pisces. (That’s me 🙂 ). And it is a perfect fit. Like we’ve read in this blog before, Lapis Lazuli is the gem of trust. When we seek to become more sincere, act more responsibly, or become more trustworthy or faithful, lapis give us the focus we require. Lapis lazuli is excellent in ensuring that we are acting out our lives as worthy of the trust of our friends, acquaintances and community. Lapis Lazuli has been considered a Birthstone since the Breastplate of Aaron. It has been in different lists of birthstones in time, but still remain very popular. And really isn’t it nice to know that you are helping someone by providing an effective healing tool when you give someone a birthstone jewelry gift? The best way to give birthstone as a gift is in form of pendant or ring. People have believed since ancient times that carrying a stone not only brings them healing but also influences ones fate, brings love, health and wealth. Ancient manuscripts mentioned the use of precious and semi precious stones as amulets and talismans. The belief was that powerful spirits live inside the stones. So, let’s see the importance of this belief for past, present and future generations. A talisman is capable to emit a magical force to help the owner. Talismans are believed to bring luck and protection. One of the legends surrounding them says that a giant who lived way before the great flood invented the talismans. Using his talismans this giant was able to influence the fortune of people who asked his help. The Romans also used plenty of talismans. A well-known story about talismans in the Roman Empire is about the Roman senator Norie. He valued his talisman so much that chose to resign his land and wealth, fall in disgrace and expatriation than to give Mark Anthony his talisman, the ring with Opal and Lapis Lazuli he owned. Another story related to talismans is about a Russian singer Feodor Chaliapin. When his singing partner Ylka Popova lost her voice, only with a great effort Chaliain convinced her to wear his talisman ring with a diamond stone. Feodor told her that it belonged to Peter the Great and that it guaranteed the perfect voice and good fortune. She never lost her voice again. Chaliapin never got his ring back. A talisman is both focus and a natural amplifier. As a focus it serves to control your feelings to lead you to the right thought. As an amplifier a talisman brings you the ability to join with the power and energy of the Universal Life Force and the Life Force of this planet. Lapis Lazuli as a talisman is especially important for gaining respect, keeping negative energy away and for helping us to remember to be humble in our dealings with others. What again serves you right if you’re looking for spiritual growth. If you want to develop quick of mind you should also wear Lapis Lazuli. 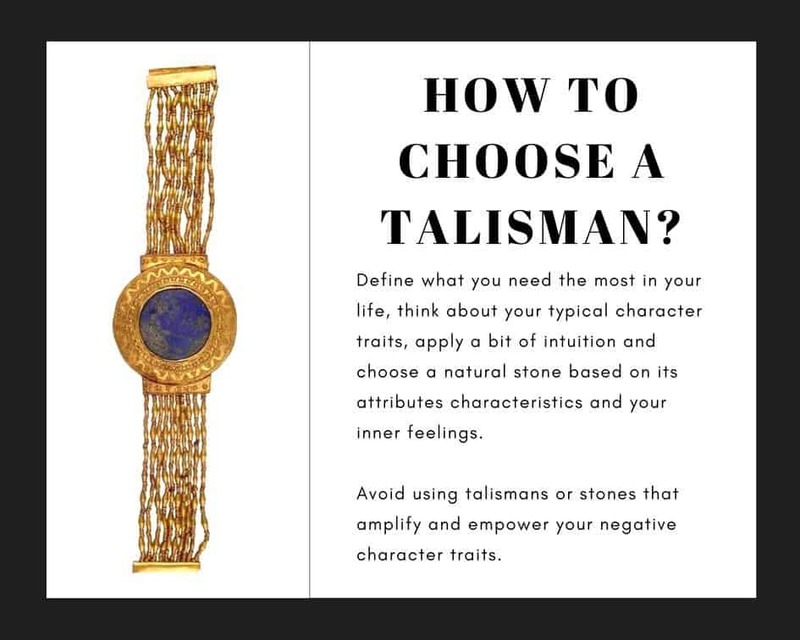 How to Pick a Talisman? Choosing the right talisman is very important. People who are violent and short tempered should always avoid adjutant stones (usually red colored). For example, Ruby can provoke such people to act irrationally. On the contrary, when it is carried by a shy, timid persons, it wakes up their will to win. It thrives away melancholy and boosts their vitality. Opal, for example, is a good stone for melancholic people. It gives them hope, helps out of depression. Lapis lazuli as talisman suits everyone, but eve better it fits overly active, short tempered people as it centers and calms them deep in the soul. Your zodiac sign can be your talisman, but also any jewelry you like. Talismans called to stimulate all the good sides of their owners. Psychologists state that if the person trusts in the talisman, she/he easier reaches established goals and better resists everyday sorrow. According to Wikipedia, an amulet is an object which most important characteristic is the power assigned to it to protect its owner from danger or harm. Unlike a talisman, Amulets protect its owner against undesirable influences from outside. Amulets smooth external negative impulses which can harm its owner. They are supposed to be worn under the clothes, away from stranger’s sight. Throughout history, the most popular amulets were the ones in shape of a heart. They were made from Carnelian, green Jasper, Basalt, and also from the magnificent Lapis Lazuli. The Ancient Egyptians considered the heart a life center. They had great respect for it even after death. The heart was placed in a special vessel and buried it with a mummified corpse. The heart was represented symbolically by a scarab. Egyptians have made the scarab an emblem of the world, paternity and also the human being. The scarabs personified the peoples dream of immortality. 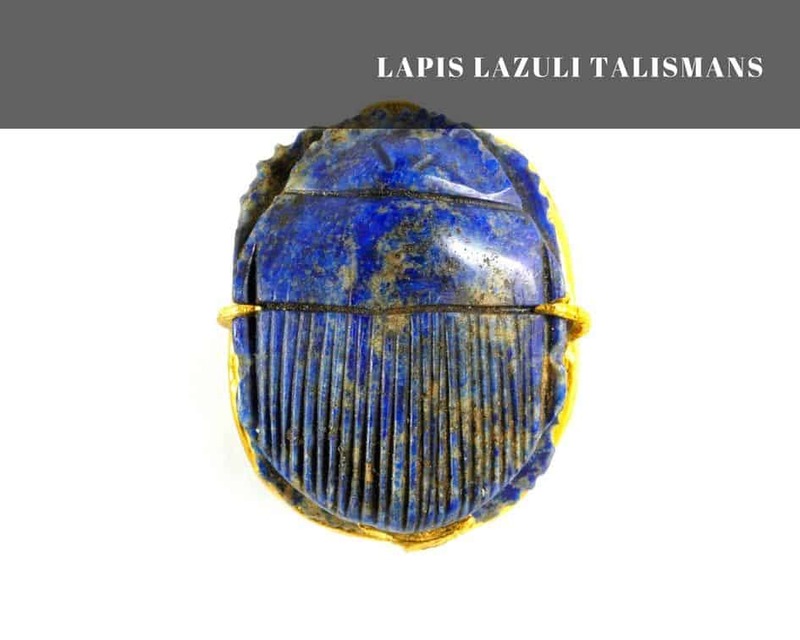 For example, Tutankhamun’s tomb was full of Lapis lazuli scarabs. A lapis scarab was placed over the site of Tutankhamun’s heart to prevent the heart from incriminating him in the underworld’s Hall of Judgment. Large lapis scarabs were also placed under the mummy’s wrapping in place of the heart, which had been removed along with other organs during the embalming process (not done usually). 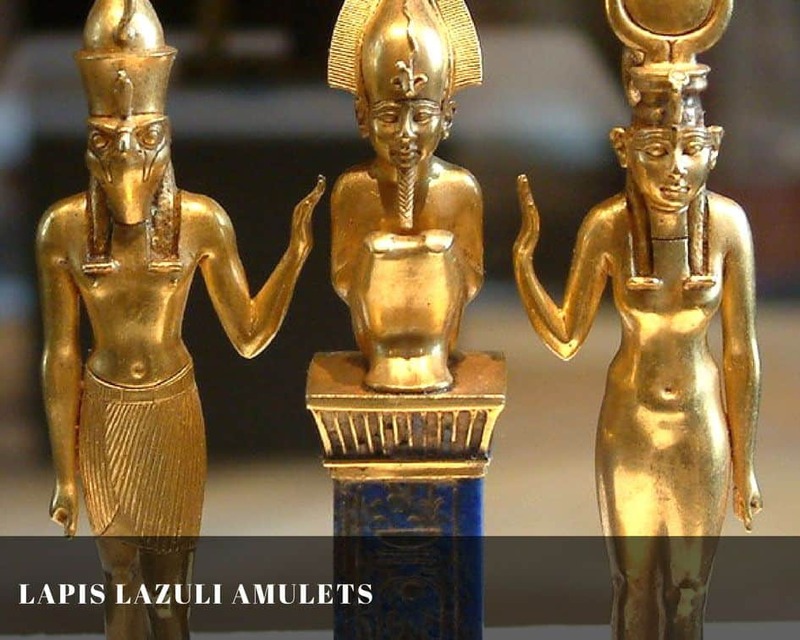 To learn more about the reason of it as well as uses and importance of lapis lazuli in Ancient Egypt check our Egyptian Lapis Lazuli post. As with Tutankhamun, elaborate pectorals of Lapis Lazuli, carnelian and also gold covered the pharaohs Osorkon’s chest, while rings and bracelets of the same combination also adorned his arms and fingers. A tiny, but endearing group in gold and also lapis fund in his tomb shows Osorkon II as the god of the dead, Osiris, crouching on a lapis lazuli pillar engraved with cartouches bearing his names. With golden statues of Horus and Isis on either side. A major motivation for Trans African trade from the ninth century right across the Muslim world from West Africa to Badakhshan and beyond was the pilgrimage to Mecca, which was undertaken by thousands of West Africans. Pilgrimage was hazardous and an amulet made of the precious Lapis Lazuli was believed to protect one’s path. Roman legionaries also carried lapis rings with scarabs because they believed these rings will give them courage and force. So, what can be an amulet? Potential amulets include gems, especially engraved gems, statues, coins, drawings, pendants, rings, plants and animals. Words used in the form of a magical spell or incantations to repel evil or bad luck are also considered amulets. The latest researches confirm that as a stone was “born”, “lives” and “dies”, it means it’s not a dead matter. That it is a living organism capable to radiate and absorb energy and, therefore, interacts with the person. Good and evil forces surround us constantly. Since ancient times people have used stones like Lapis Lazuli to channel the good forces and repel the evil ones. So, if you feel that you need a protective talisman, choose lapis lazuli. It is always a safe bet and strong protector. Remember, if the stone delivers pleasure and installs belief, it means the stone was yours from the beginning. Lapis lazuli embodies the image of the boundless universe painted by nature. 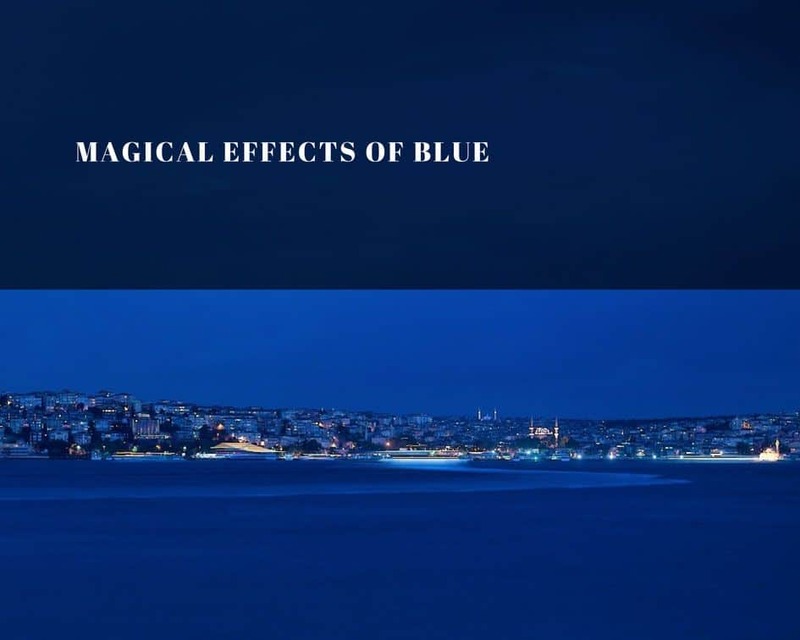 Some people affirm that they can loose themselves in the depth of this magical color, similar to the blue light of the Greek ocean when water and air melt into one another on the horizon, when the polarities of sky and water merge. The tendency of blue for depth is so great that it becomes more intense particularly in darker shades and appears, appropriately so, more internal. The deeper the blue, the more it calls a person into infinity and awakens the longing for pureness and ultimately transcendence. The Greeks considered blue merely vapor and air – nothing material; a color of perspectives, ethereal as the color of the sky, the ocean, the shadow of the moon, the unreal. 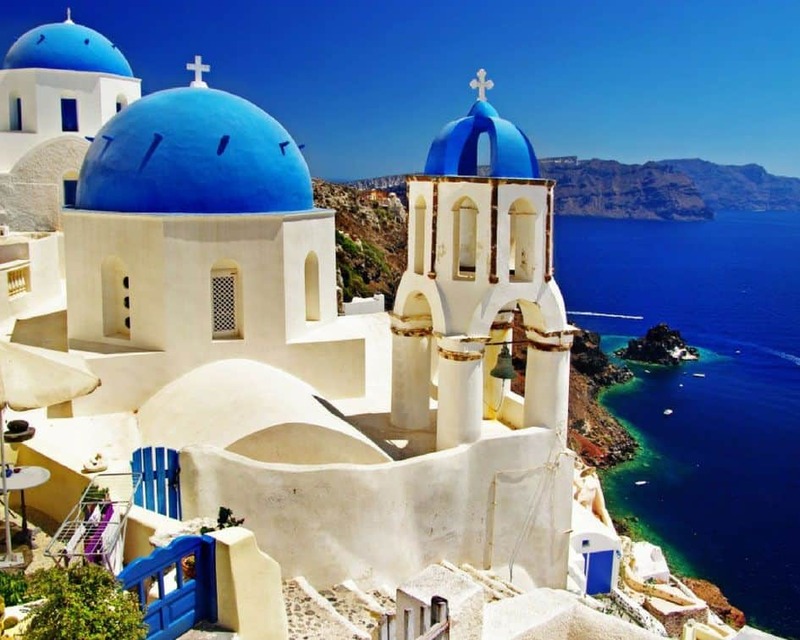 Moreover, many traditional Greek buildings have the color Greek Blue on them. Greek Blue is more commonly found on doors, roofs, fences. During the Renaissance and into the 1800s, paintings done with ultramarine blue (pigment made of lapis lazuli) were considered to be a luxury because of their high cost. High-quality lapis lazuli was mined in Afghanistan and transported to Europe to manufacture ultramarine blue. This costly pigment was normally used by only the most accomplished artists and those who had wealthy clients to support the additional expense. Check our Ultramarine Blue post, to learn more about it. Blue is the color of the spirit, devotion and religious study. That’s why Lapis Lazuli was considered a magical stone and widely used in ancient rituals. It enhances contemplation and prayer. On the other hand, blue’s devotion can be to any cause or concept it believes in, including devotion to family or work. 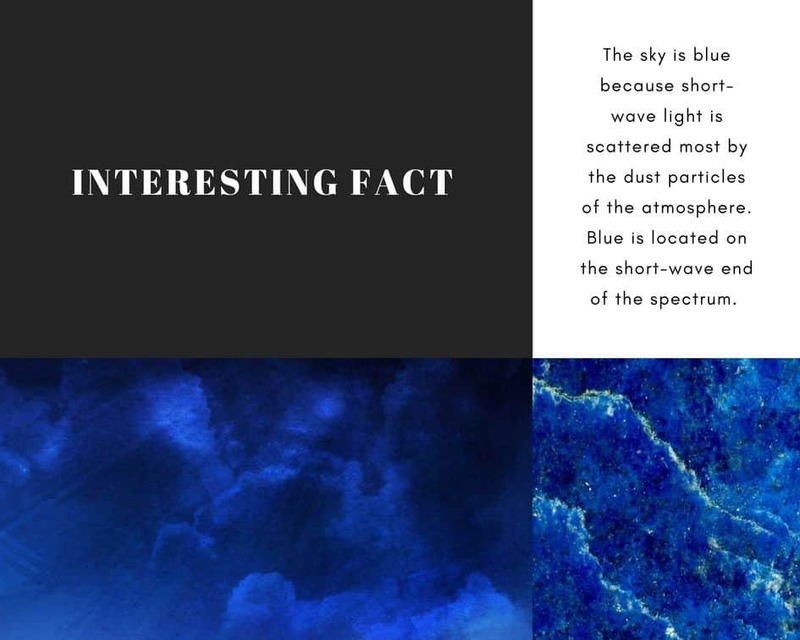 The sky is blue because short-wave light is scattered most by the dust particles of the atmosphere. Blue is located on the short-wave end of the spectrum. The shift of the spectrum lines toward the short-wave end caused by the Doppler effect is called blue shift. Blue is a color that is easy on the eyes. It conveys calm and deep harmony. Looking at the color blue activates the parasympathetic nervous system, the adrenal cortex excretes cortisone; blood pressure, pulse and production of adrenaline decrease. Pale Blue: Pale blue shows some kind of creativity and the freedom to break free. 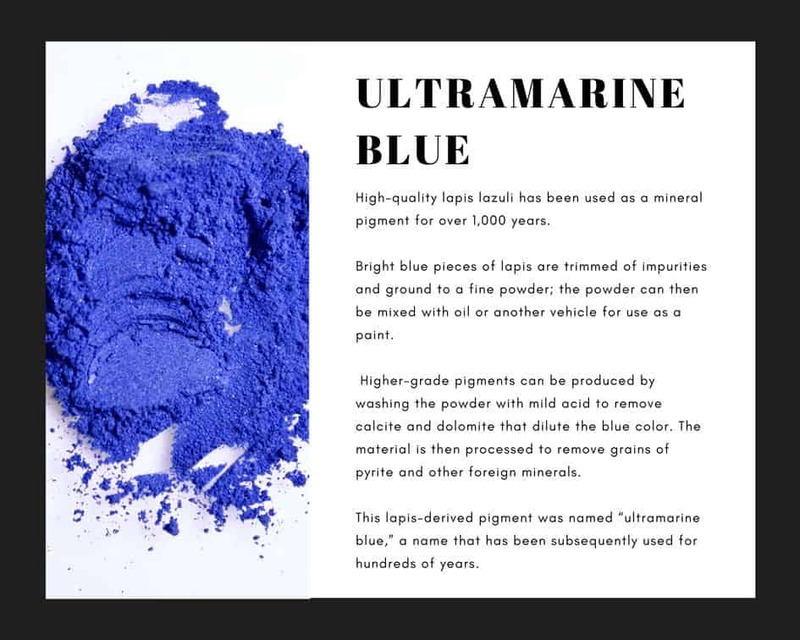 Ultramarine Blue: Ultramarine blue made from lapis lazuli is one of the few natural pigments which has a permanent and vivid blue color, good opacity, and high stability. It has always been very expensive and today can sell for over $1,000 per pound. The color itself is very potent and very stimulating. Choose this color if you need some energy boost in life. 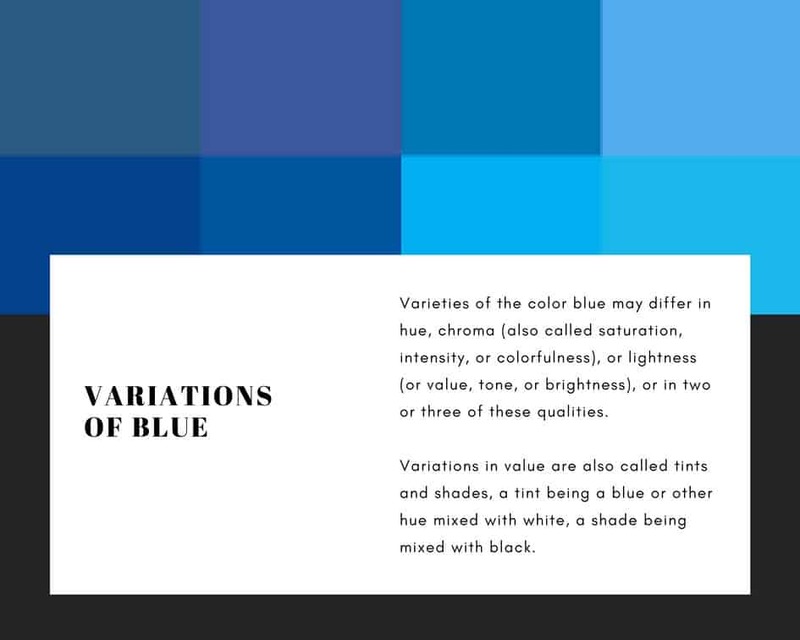 Learn more about it n our Ultramarine Blue post. Dark Blue: Dark blue is the color of conservatism and responsibility. Although it appears to be cool, calm and collected, it is the color of the non-emotional worrier with repressed feelings, the pessimist and the hypocrite. Dark blue can be compassionate, but has trouble showing it as its emotions run deep. Dark blue is a serious masculine color representing knowledge, power, and integrity, and is used quite often in the corporate world. Conservative: The color blue is a safe colour – the most universally liked colour of all. So, there is almost none who could say that lapis lazuli annoys or irritates them. It is a perfect gift that will fit all, from small children to elders, because we all need some calmness of the blue in our everyday lives. Predictable: Blue is not impulsive or spontaneous and it doesn’t like to be rushed – blue needs to analyze and think things through, and to work to a plan. If you need some wisdom in life, choose lapis lazuli and its blue colour to guide you through. 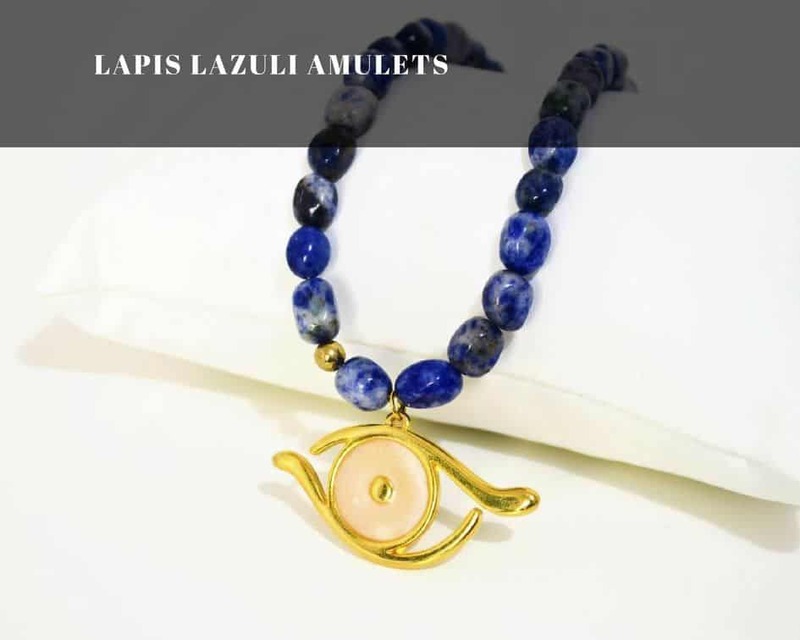 Lapis lali wil make you calmer, wiser, and more cogitative. Orderly: Blue needs to have direction & order- untidiness and unpredictability overwhelms it. If you need some order in your life, chose lapis lazuli. It will stimulate your tidiness and self control and here I would tell on my pwn experience that it is 100% God honest truth. You know, if your child is like me – “a misunderstood genius” with its own ideas about order, buy him or her a lapis lazuli necklaces and see the potent effect it will have on their willingness to clean after themselves. Rigid: Blue likes familiarity. It doesn’t like change and will stubbornly do things its own way. Yes, maybe lapis lazuli does not inspire in you the passionate creativity the ruby with its red does, but it will provide you with sense of consistency and purpose. Will make your will stronger and you – harder, supporting you on a way towards achievement of your goal. You will not go fast, but you will go no matter what obstacles are on your way, like a blue whale. I hope you were inspired by fairy blueness and its positives effects. That’s why I would like you to invite you to visit our online shop – Nammu.com, where a lot of jewelry pieces with Lapis Lazuli are available. Subscribe to our blog if you want to get even more interesting information about this fascinating stone, as well as magnificent amber.